In a post at the TI Discussion Forum, Jason asked for help with a scissors kick. I hope someone can help. I feel I have the TI technique down EXCEPT the two beat kick (2BK). For some reason my leg goes to a 90 degree angle at the knee when I kick. I know this is creating drag and want to correct it. I’ve tried everthing. I have even thought about tieing my feet together in a shallow pool. Any suggestions? I’ve spent years on my own 2BK “project.” But even before giving the 2BK much attention, I had spent over a decade focused pretty narrowly on the many ways in which one can reduce drag. I began a shift toward efforts to improve propulsion around 2000, thinking mainly about my armstroke for a few years. In 2004 I began to focus on my kick. 3) Synchronize leg beats with hand-spear. 4) Use less muscle to accomplish #3 – shifting the work from quads to core. 5) Focus again on streamlining the kick – using toe-flick rather than leg-drive. Eliminating a scissors — or other leg-splaying habits — falls into #2. The most helpful thing I did to streamline my kicks was improving lateral stability – i.e. controlling rotation. Besides imprinting controlled rotation in Skate and SpearSwitch, I also focused on keeping my elbows as high and wide as possible as I completed extension. I’ve described my 2BK process and project in detail in Chapter 7 “How to Kick in Open Water” of the Outside the Box ebook. Have searched for a “TI community” in Norway – i cant find one, do you guys no anything? jason-Kim Bade (terrific TI coach from Rochester, ny) gave me an easy drill to help eliminate my scissor kick. With a small buoy under each arm for floatation, “stand” in deep water. While in this vertical position, and with legs straight, bring one leg slightly forward, the other one back. Now simply bring them together in a quick move. It’s magic. Now do it the other way. You should find your self gently rotating. This is essentially the 2bk move. Of course, the next step is to translate that into your full stroke, but the feel is finally there, and the rest really begins to make sense. No more scissor kick! Thanks to both Terry and Kim. Do you recommend stretch cords that keep ankles together to eliminate scissor kick? Stan Some recommend that, but I’ve gotten great results by doing something similar, without the cords. 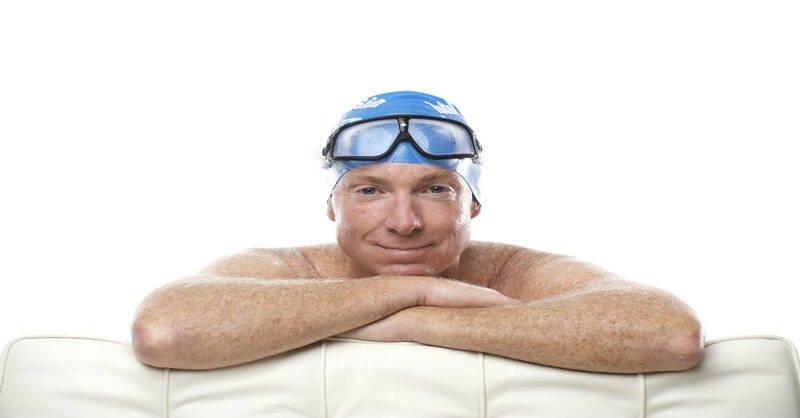 I just swim short distances – 25 yds or less – focused on keeping my ankles as close together as I can. What this forces me to learn is how to control instability in my upper torso – in similar ways to how this blog advocates. Great suggestion, Chris. Thanks for sharing it. Why don’t you post it on the Forum, on the same thread from which my blog was drawn. 1) Post a query on the Find a TI Buddy on the TI Forum. 2) If management allows, post a notice on the bulletin board at the pool(s) where you swim, asking others who practice TI – or would like to – to contact you. You could also use social networking sites – including posting something on the wall of the TI Facebook page, and perhaps on any such networks (is there a Craigslist in Norway) where you are. I also have started working on my legs after several years on arms and core. I found practicing kicking on back was helpful. Getting out of the pool and jogging around it once helped make me remember my legs. The “standing exercise” is useful, will try the buoys because otherwise I sink after a very short while. In breaststroke ankle flexion while gliding propels one forward. Is this what Terry means by the flick of the foot.? Terry, re your response to Jason (5/22/10) with your 2004″focus on my kick”..AND seven organized efforts. I’ve been enjoying doing all seven as I glide with each stroke, especially using #3-“Synchronize leg beats with hand-spear” ;#4 “..shifting the work from quads to core” (rotation) and #5 “…using the TOE-FLICK rather than leg drive.” The last my current favorite sign revealing “relaxed” or “NOT relaxed”. If the latter, time for “vertical kicking”(which actually moves me down the pool..orif I choose, in a circle. but enjoy the pace of 100yds @ 5:00 or 600 yds @ 30 minutes. The Zoomer was just stiff, dead weight to me. BUT..the $130 Force Fins ADJUSTABLE “SLIM FINS”–what super flexibility! !–you recommended & sold me 5 yrs or so ago, FINALLY helped me co-ordinate my leg and arm work. (Stored in closet now for a future “interval exercise.”. Rather simultaneously, I bought THE RACK to get my 90 degree foot angle looking somewhat like the ballerina-straight feet of Phelps & company, to 1) cut drag & 2) give the flexible TOE-FLICK. The set up: 1)Plastic board fits beneath with pointed end fits below door. 2) Two adjustable straps allow working on lower or upper foot bones. 3) With foot strapped,one gradually lay backward–yes, “ouch”–to stretch the bone joints. ( I was about 69 yo starting the workout daily or so for year or two. Younger bones would go for it!) A gauge is given to measure progress. My daily excercise includes GENTLE flexing these foot joints in & out of water. When I feel ANY pull/strain in my toes swimming. I stop and wiggle/wave my toes to get back to your TOE-FLICKING. NOW! I’ve also used YMCA locker carpet floor to maintain the foot ROM, by kneeing back on my feet. And exercise that could be in lieu of THE RACk. ( Itgets gymn buddies to say “ouch” when they see me. BUT , hey ROM is the name of the game, tight TerrY? BTW:Just rcvd the TAI CHI dvd. Looking forward to it bringing me more training in relaxed, centered, smooth swimming. Herb. You are a true exemplar of a tireless Kaizen Spirit in your TI Practice. Well done and thanks for sharing. 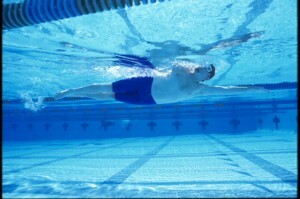 The tip that worked for me was to use “swim on your side” drills but with a focus on the kick. I use the 8 kick RRL, 8 kick LLR with a focus on a vertical side (facing a wall), head/chest down, extended arm by my ear and a smooth two way kick with focus on foot position and flicking to feel the water slide off the top of the foot when extending. I do 3×50 with 15 sec rest then swim a 50 free focusing on the same kick but with my hips and feet sliding through the “hole” my head and shoulders create . Then I do 8 kick RLR, 8 kick LRL keeping the same smooth flick kick and focus on timing the kick, reach, and my roll to the other side again 3×50 followed by a 50 to incorporate the feeling into a swim. This helped me develop a smoother kick and it helped be develop a sense of having my body roll timed to my recovery to reach where my recovery to reach shoulder roll helps keep my hips up more so my kick just stays inside my streamline without any focus or effort.